The 4th of July: it's a patriotic time of year. 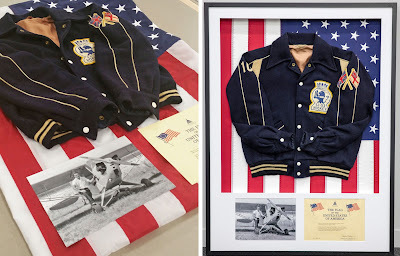 So, if you’re thinking of framing a flag or maybe a few historical documents, follow these tips from American Frame's Commercial Department Manager Jennifer Teachout. When working with any historical item, take steps to handle it carefully. Make sure your work area is clean and dry. And consider wearing gloves to avoid leaving any dirt or oils from your fingertips on the piece. 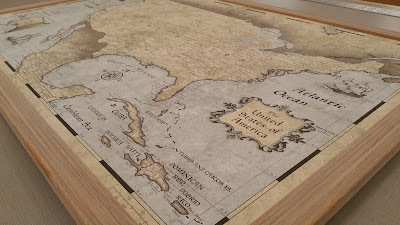 When framing maps, documents or flags, you’ll probably need to use some kind of insulation to support the weight of the piece or help it lay flat. If you need to support a heavy piece, foam mounting board is your answer. For extra protection, choose archival foam board. When wrapped tightly, flags are relatively heavy, so they need extra support to stay put. Sew the flag to the mat or backing board. Consider the weight of the flag when deciding how many stitches to use and where to place them. If your map is printed on both sides, mount it on black foam board so the text on the back won’t be visible through the thin map paper. Never slather the back of a rare document with glue. Instead, Teachout advises attaching archival strips or corner mounts to archival mounting board. 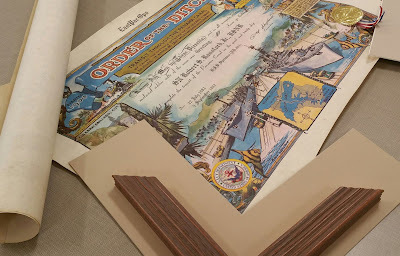 You can then use a custom-cut mat with a window opening to attach your document to the mounting board. After you’ve selected the right mat, choose a wood or metal frame that complements your item. Consider our American Hardwoods collection to complete your all-American look. And to keep dust and fingerprints off your memorabilia, mount it under an acrylic sheet. I wanted to ask help with a research paper, cause I don't how to frame it properly, so it could be visible and easy to turn pages. Find most reliable service which consists of professional UK essay writer.The essay writers will ensure that all of your academic dreams come true and that you achieve the highest success.Our essay writers can produce impressive essays each time. Their expertise in the matter reflects in the superior quality of their service.We never miss deadline for any of the essay. Essay help has a reputation of delivering the work within the stipulated time. Lab report writing and analyzes a laboratory experiment. We are a leading academic writing service provider. We provide a comprehensive solution for all the problems that students face while writing a lab report. Case studies determine your ability to apply hypothetical concepts in real life. Our experts can provide a descriptive, exploratory and explanatory analysis of all the Gillette products within a short time frame. We provide the Gillete swot analysis according to the latest University guidelines to help you fetch an A+. Students Assignment Help caters its best research proposal writing help for the students. We have 3000+ highly qualified academic writers. Our professional Writers present writing services for students with the best quality. They ensure delivery timely of the assignments.